What's on my table right in front of me is my Wacom tablet and today I have my Nexus 7 in front as well because I had downloaded a book from the public library and was listening as I sketched. I used to pay to rent audio books at bookfree.com when I had my long daily commute to work. I liked them a lot because there were a couple of times when my returned CDs never reached them. They never questioned or charged me for them and just sent me my next CDs on my queue. Anyway, back to my sketch ... I did it with my SBP and of course those are not the only 2 things on my table. As a matter of fact my table is a mess and it will be a disgrace to show anyone. I used the ruler tool to make those nice straight lines and the eclipse tool to make the nice curve on the bottom of the wacom tablet. I used to feel guilty using any of those tools. I felt like I should do everything free hand. But then I remembered reading drawing some how to books that used the same kinds of tools. Well, I decided I am not going to feel guilty about this anymore and I will all the tools available to the fullest to enough myself. For each additional part of the sketch, I would add it on a new layer. After I am satisfied with it then I will merge them. I a lot of times I will keep quite a few layers and go back and forth between them and merge them all at the end. I still mess up which layer I am on sometimes even having labeled each layer. I just get too into the drawing and forget to switch. I know I should have included the ear buds that I had plugged into the Nexus. I was listening to my audio book as I was drawing. So that's my excuse for not having them. But to be honest I was getting a little lazy and didn't feel like drawing them. I had taken some pictures of this tablet and the dates on them was 2008. So I had this tablet for at least that long but I think I had it longer than that. 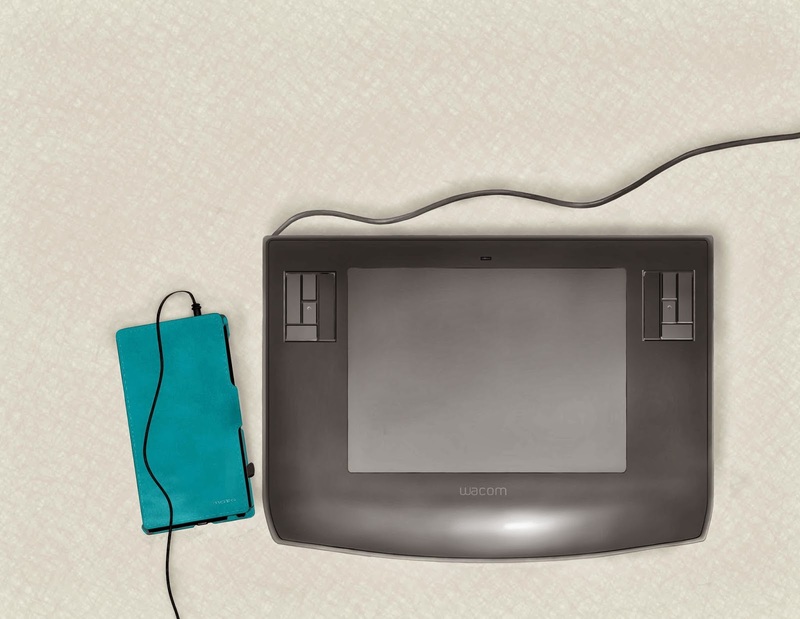 I didn't use it that often back then and any serious digital artist used to have at least the Intuos 4. Since I was not (and still is not) a pro buying an Intous 3 was way too much and expensive. Ah well, those were definitely the days when I used to buy things just to buy. i can't believe you drew this! My family all got jolted out of bed by the earth quake this morning. Felt like I just fell asleep.